Visit a Prague tourist information centre or simply read our guide below. It offers practical visitor information and advice to help you plan your Prague trip. -Old Town Hall, Old Town Square 1, Prague 1. -Rytířská 12, Old Town, Prague 1. -Wenceslas Square 42 (kiosk near Štěpánská street), New Town, Prague 1. For information on the sights, read our guide to the Prague sights & attractions. 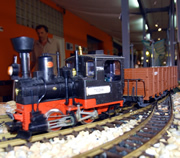 For information on the layout of the city and key facts, read Prague tourism. Food and drink in most restaurants, cafés and shops in Prague is cheaper than in Western Europe. Beer and wine in pubs is considerably cheaper. Prices for clothes and durable consumer goods are similar to in other European countries. Czech banknotes are issued in the following denominations: 100/200/500/1000/2000/5000. Some hotels, shops and restaurants accept Euros as well, but many only take Czech Crowns. 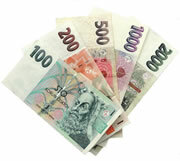 At current exchange rates 1000 CZK = £34/€40/$45. The best exchange rate is usually obtained by withdrawing Czech Crowns from the cash machine (ATM) of a bank in Prague, even accounting for any transaction fees charged by your own bank (ask your bank what their fees are). Cash machines in Prague accept debit and credit cards backed by Visa, Mastercard, American Express and Maestro. 1. Use a debit card if possible; fees are normally lower than for a credit card. 2. Use the ATM of a bank, not a currency exchange ATM. Even better, use the ATM at an actual bank, not in a random location; some (not all) stand alone ATMs impose extra charges. 3. Some ATMs offer the option to 'pay using home currency'. Ignore this and opt to 'pay in local currency'. The transaction will then be converted at a good international rate authorised by your own bank. If you select 'home currency', the ATM converts the Czech Crowns at its own rate, which is usually a poor rate; this is called Dynamic Currency Conversion (DCC). Avoid it. City Centre ATMs: Czech and International banks are most prevalent in and around Wenceslas Square in the New Town. All have ATMs. In the Lesser Town there is an ATM at Česká spořitelna bank at the top of Mostecké street (the road leading from Charles Bridge to the Lesser Town Square). Prague Airport ATMs: At Terminal 1, exit customs and in the arrivals hall the ATMs are located to the right, by the stairs. At Terminal 2, exit customs and in the arrivals hall the ATMs are located to the left - Prague Airport Guide. To change cash for Czech Crowns, the best exchange rates are available in the city centre, but be careful where you go. For excellent rates and no commission, we recommend: eXchange at Kaprova 1 (near the Old Town Square) and Samiko Exchange at Štěpánská 39 (near Wenceslas Square). Banks, which are mostly located in and around Wenceslas Square, offer good exchange rates too, but they do charge commission. Be wary of small currency exchange booths. Some offer reasonable rates, but at many, offers of 0% commission and confusing signs mask a poor rate. Ask what the total amount you will receive is before handing over any money. Credit cards are accepted in most places in Prague, for example in hotels, restaurants and international shops. However, some local shops, cafés and bars do not take credit cards. Cash is still king in the Czech Republic, so if you able to do so, pay in cash. Prague is a lovely city to visit all year round, and the contrasts in temperature and weather only add to its appeal. Tourist services like restaurants, theatres and the sights and attractions are well equipped to welcome visitors at any time of the year; places are heated in the winter and many are air-conditioned in the summer. While sightseeing is a major activity in Prague, the city is also somewhere to kick back and relax. On fine weather days from early spring through to late autumn, an al fresco drink outside a bar or café basking in sunshine could be one of the highlights of your trip. In the winter, the bars and pubs and traditional cafés can offer a warm, cosy respite from the cold. Hotels are most expensive in May, April, June, September and October. The cheapest hotel rates are available in July and August and from November to March (despite the popularity of the Christmas markets, hotels are still good value in December). The prices for sightseeing and entertainment remain the same all year round. The weather in Prague varies dramatically between the seasons, far more than for example in London. Summer (June to August) is often hot and sunny, reaching the high temperatures of Paris. Whereas winter (December to February) can be very cold, with lengthy periods of snow. In spring and autumn, Prague enjoys long spells of warm sunny weather, interspersed with dull days and heavy showers. 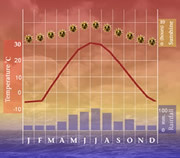 The average high in July/August is 23°C (73°F), although at least one heat wave can be expected, pushing temperatures up to 35°C (95°F) and beyond. The average low in December is -2°C (28°F), in January -4°C (25°F). But both months can bring considerably colder weather for days on end. The weather in Prague is highly changeable, as elsewhere in Central Europe. On good days in spring, summer and autumn, visitors will find cool shirts, shorts, skirts and dresses most welcome, and bring sunscreen, sunglasses and hats. However, even in summer bring a fleece and a waterproof jacket or umbrella, in case of a cold snap or heavy shower. In the winter, bring a warm coat, hat and gloves. Waterproof shoes are also a good idea in case of rain or snow. Prague is a wonderful city to explore on foot, so a comfortable pair of shoes is a good idea all year round. The city centre is compact, making it easy to walk between the sights and attractions. And the most important sights, such as Prague Castle and the Old Town Square, are only fully accessible on foot. While it may be nice to dress smartly, and many people do, Prague is a reasonably casual city. Restaurants, opera houses, theatres and other tourist venues do not have strict dress codes and accept most forms of attire. Fast Internet access at speeds of up to 4G is widely available in Prague. Internet enabled phones, tablets and other devices connect easily to Vodafone, EE, T-Mobile, Three, Orange, Telia, Movistar, Telekom, O2, China Mobile and other networks. Wi-Fi is freely available throughout the city. Most hotels, apartments and restaurants offer free Wi-Fi, as do many pubs, bars and cafés. Wi-Fi is also free at Costa Coffee, Starbucks, KFC, McDonald's and at Prague Airport. International Dialling Code for Czech Republic: +420. Public telephones require a phone card. These cost 200 CZK, 300 CZK and 500 CZK, and can be purchased at post offices and newsstands. Directory enquiries: Czech numbers: 1180. International numbers: 1181. Municipal Police: 156. Police: 158. First Aid: 141 23. 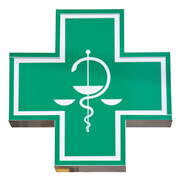 Pharmacy: 141 24. 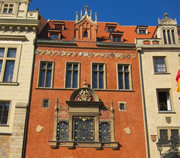 Central Prague Post Office: Jindrisska 14 (off Wenceslas Square), Prague 1. Domestic letters & postcards: 19 CZK (50g). 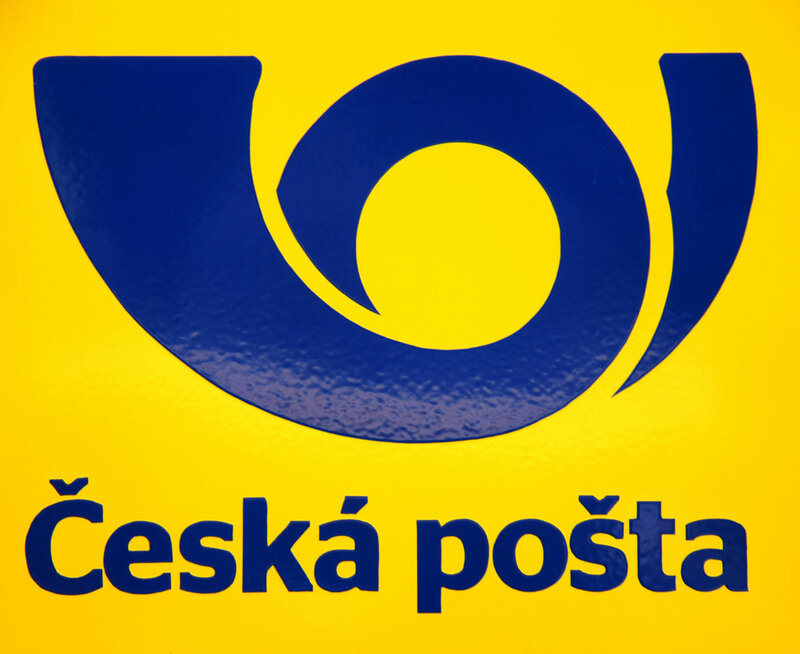 International letters & postcards: Europe 39 CZK (50g); Outside Europe 45 CZK (50g). As in most of Northern and Central Europe, the electricity supply in Prague is 230v. Electrical sockets take standard European two-pin plugs. British, North American and other tourists should bring adaptors. In Prague, adaptors can be purchased at Tesco or at Euronics at Palladium Shopping Centre. The Prague public transport network is cheap, efficient and highly integrated. Public transportation runs frequently during the day and at night, and a single ticket permits travel on all trams, buses and the metro. Prague is a relatively safe city to visit; safe to walk around and to travel on public transport, including at night. Assaults are extremely rare. However, as in any city, the tourist is a target for the unscrupulous: Pickpockets are skillful, so keep a close eye on valuables; Do not use your back pocket for your wallet; Avoid hanging handbags on chairs in cafés. Observe the golden rule: If you don't need to carry it, leave it in the hotel safe. Beware over-charging: In restaurants, check the bill carefully; In taxis, insist the driver puts the meter on - and if there is no meter, agree a price before you set off; Avoid small currency exchange booths - see our advice on currency exchange above. Prague Experience aims to help visitors enjoy their trip. Tourist services listed on this website have been tested and approved. And once listed, if a service subsequently falls short (places do change), they are removed. For Prague airport transfers, we use polite, honest drivers. Our accommodation is of a high standard. Our restaurants serve great food, with good customer service. And we only list the best sightseeing tours and the best performances at the opera houses and concert halls and theatres. Tips are naturally welcomed by staff working in the tourist industry, although the feeling is generally relaxed. Staff do not tend to chase tips. 5%-10% is appropriate. The exception is the overpriced touristy restaurants, which Prague Experience do not list. To avoid them, you may wish to consider the ones listed in our Prague restaurants guide. Smoking is illegal in enclosed public places in Prague and the Czech Republic, including in pubs, bars, cafés, restaurants and theatres. As already stated, Prague is relatively safe. Parents need have no extra concerns for their children over the normal care one would take in a city. There are plenty of activities for children to participate in: Gothic towers to climb, a funicular railway to ride, swimming pools, parks, museums, Prague Zoo, Sea World, river cruises, and a host of puppet and black light theatre shows: children's activities in Prague. Most restaurants and cafés welcome children, some have high chairs for babies. While kids' menus are rare, waiters are happy to suggest suitable dishes for children from the adult menu or perhaps offer half portions. And smoking in restaurants is banned. Importantly, watch out for trams when you cross roads. They have the right of way. Wheelchair users and people with walking difficulties will be pleased to note that Prague's city centre is highly compact, with many of the sights and attractions located close to each other. Stay in a hotel in the city centre (Prague 1), and if you can walk or be pushed short distances you can participate in much of the sightseeing and entertainment on offer without using public transport or taxis. There are cobbled streets in certain areas of the city, notably in parts of the Old Town, Lesser Town and at Prague Castle, but while the cobbles can be a little hard going, you should not find them too onerous. The New Town is generally the most suitable area to stay in, particularly around Wenceslas Square (see hotels and apartments). Road surfaces are more even, and the hotels, restaurants, shops and entertainment venues tend to be more modern; buildings are more likely to have lifts and be more spacious. For your arrival in Prague, book your airport transfers through Prague Experience, tell us your requirements, and we will arrange for a suitable vehicle to meet you. On public transport, accessibility for disabled passengers, prams and baby buggies is fairly good: over half of metro stations provide wheelchair access to the platforms via lifts, and newer trams are adapted for wheelchairs, prams and baby buggies. Both international railway stations have lifts to the platforms. A challenge for wheelchair users is the severe lack of disabled toilets. Many buildings are ancient and have preservation orders on them, so cannot be adapted. But in other instances, efforts simply have not been made. With regards to eating and drinking, there are many restaurants and cafés in Prague at street level. Others are located in cellars and on roof tops, with some serviced by lifts. Read our guide to restaurants with wheelchair access, although we reiterate the point that disabled toilets are rare. Most opera houses and concert halls and theatres are accessible to wheelchairs. And if you book tickets through Prague Experience, we will ensure you are seated in the correct area. River cruises are a good option for wheelchair users seeking sightseeing and entertainment. Access to the quayside is via a gentle ramp (which pedestrians, wheelchairs, taxis and mini-coaches can use). From the quayside, users of light folding wheelchairs can board all river cruises (staff can assist where necessary). Heavy electric wheelchairs can only access certain boats. One of our cruises also has disabled toilets, the Prague Panoramic Dinner Cruise. Many Prague sights and attractions are accessible to wheelchair users, should you wish to make your own way around the city. However, there are no daytime tours of Prague we can recommend that are suitable for wheelchair users or people with severe walking difficulties. The city is highly pedestrianised, therefore all tours involve a fair amount of walking, and there are steps to contend with. If you walk fairly well, albeit at a slow pace, and can handle steps, the Prague Grand City Sightseeing Tour & Boat Trip, Jewish Quarter Walking Tour and the Prague Castle Tour may be suitable, but check with us first. We do offer a couple of evening excursions in Prague that suitable for wheelchair users and people with walking difficulties. The following include pick up from your hotel: Prague Dinner Cruise & City Tour and Traditional Czech Night. We also offer daytime tours to places outside Prague that are suitable for wheelchair users and people with walking difficulties: Karlovy Vary Sightseeing & Moser Glass Tour, Kutna Hora Sightseeing Tour, Kutna Hora Sightseeing Tour & Shopping and Terezin Tour (Theresienstadt). For those tours and excursions that we state are suitable for wheelchair users, participants should be capable of walking a few steps, and bring a folding wheelchair and a travel companion to assist with boarding the coach. Depending on individual needs, it may be necessary to forgo certain parts of the tour. If you are a wheelchair user or have walking difficulties, when you book a service through Prague Experience it is essential to state your disability and requirements in Special Requests on the booking form. Doctor Prague, Vodickova 28, 3rd entrance, 2nd floor, Prague 1. Tel: 224 220 040. 24 Hour Emergency Tel: 603 433 833 / 603 481 361. 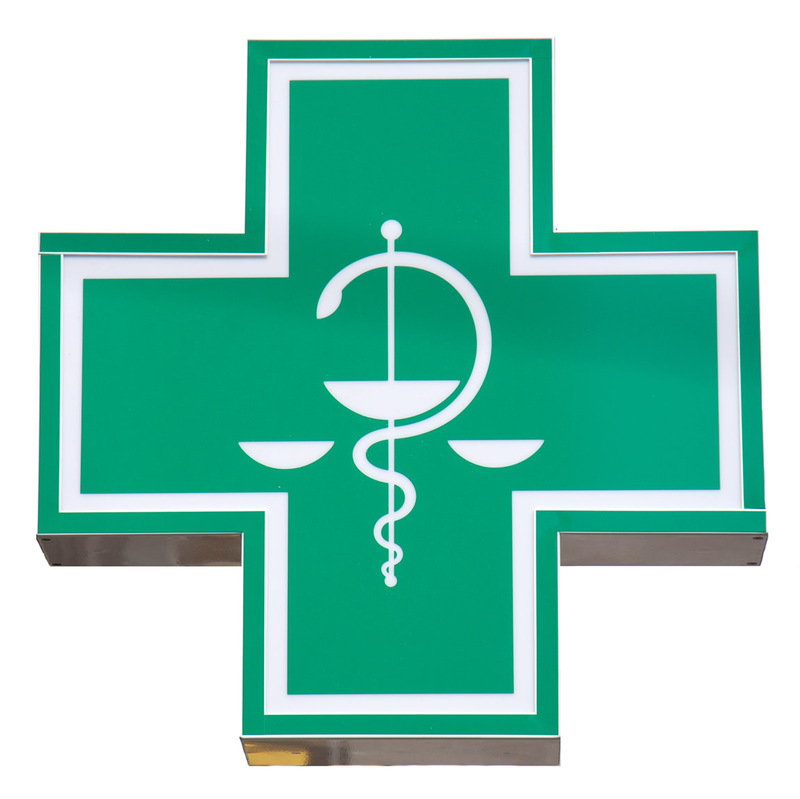 There are many pharmacies in Prague. Most chemists are located in the New Town, including in the shopping malls. Dr. Max Lekarna, Vodickova 40 (off Wenceslas Square), Prague 1. Open: Mon-Fri 08:00-20:00; Sat 09:00-18:00. Adamova Lekarna, Wenceslas Square 8, Prague 1. Open: Mon-Fri 09:00-19:00; Sat 10:00-18:00. Lekarna, Palladium Shopping Centre (Level -2), Náměstí Republiky, Prague 1. Open: Thu-Sat 09:00-22:00; Sun-Wed 09:00-21:00. Lekarna Opletalova, Opletalova 4 (off Wenceslas Square), Prague 1. Open: Mon-Fri 08:00-18:00; Sat 10:00-14:00. Lékárna U červeného orla / Pharma Point, Havelska 14 (between Wenceslas Square & Old Town Square), Prague 1. Lekarna, Palackeho 5 (near Wenceslas Square), Prague 1. Dr. Max Lekarna, Praha Hlavni Nadrazi (Main Train Station), Wilsonova 8, Prague 2. Open: Mon-Fri 07:00-19:00; Sat-Sun 08:00-20:00. Lekarna U svate Ludmily, Belgická 37, Prague 2. Malo Clinic, Kateřinská 18, Prague 2. Open: Mon-Thu 07:30-19:30; Fri 07:30-16:30. Tel: 775 785 222. Website. Nationals of EU countries, UK, Australia, Canada, Japan, New Zealand, USA and a number of other countries can visit Prague without a visa. The Czech Republic is a member of the European Union (EU) and the Schengen area, so holders of a Schengen visa are also permitted to enter the country without further paperwork. Other travellers may require a visa: visa information. 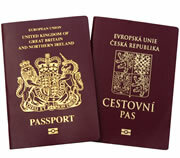 EU and UK nationals: A passport valid for the length of your visit is required (your passport must not expire before you leave the Czech Republic). If the UK leaves the EU with a deal the rules are likely to remain the same. If the UK leaves with no deal the rules may change: information for UK passport holders. Other nationals: A passport valid for at least 90 days after your departure from the Czech Republic is required: passport information. Prague 1, Karoliny Svetle 5. Open: Mon & Wed 08:00-12:00 & 12:30-17:30; Tue & Thu 08:00-12:00 & 12:30-16:00; Fri 08:00-12:00 & 12:30-14:00. Arrival: If you arrive in Prague from another EU country, you can bring an unlimited amount of most goods, including alcohol and tobacco, so long as they are for personal use. Departure: If you travel from Prague to another EU country, you can carry an unlimited amount of most goods, including alcohol and tobacco, so long as they are for personal use. If you travel to the UK, the official line is that customs officers are more likely to ask questions if you carry over 800 cigarettes, 400 cigarillos, 200 cigars, 1kg of tobacco, 110l of beer, 90l of wine (including a maximum of 60l of sparkling wine), 20l of fortified wine (up to 22%) or 10l of spirits (over 22%). Our Prague tourism guide explains the layout of the city.